Tag: Network of ELCA Colleges and Universities. 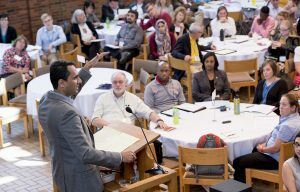 Each year, members of Lutheran colleges gather to explore the distinctive roles we play in higher education. c) the implications of “educating for vocation” beyond undergraduate education. Each college or university is urged to send a campus delegation, composed ideally of vice presidents or directors for alumni affairs, vocation and career center directors, faculty and academic office personnel related to vocational discernment in the curriculum, continuing education or non-degree programs personnel, and graduate program leadership. The make-up of delegations, however, is the decision of each college or university. A mix of administrators and faculty is encouraged. Questions may be also be directed to 612-330-1403 or voalc@augsburg.edu. ELCA colleges and universities have typically been invited to send delegations of up to five persons at a subsidized rate of $150 per person. More information about registration is available through the ELCA. Contact Melinda Valverde at melinda.valverde@elca.org for more information if your college or university has questions. The Vocation of a Lutheran College conference is supported by the Network of ELCA Colleges and Universities.